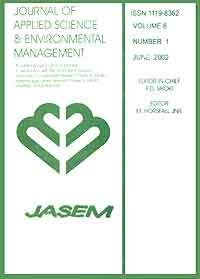 ELOM, NWABUEZE I.; DEARY, MICHAEL E. & DEAN, JOHN R.
assessment of the air quality in Newcastle upon Tyne, UK was performed by determining the trace element content in airborne particulates (PM10). Samples were collected over a 12 month period (March 2011 to April 2012) using two high volume air sampler provided with a PM10 size selective inlet. The concentrations of 6 elements (Cr, Cu, Mn, Ni, Pb and Zn) were determined. The mean concentrations of these elements varied widely across the elements with Zn showing the highest concentration (41.3 ± 42.8 ng/m3; ranging from 9.9 – 209.0 ng/m3) and Cr the least concentration (1.7 ± 0.9 ng/m3; ranging from 0.4 – 3.2 ng/m3). The total elemental content obtained in this work was compared with regulatory limit values for 4 of the elements determined and it was discovered that none exceeded the limit values.